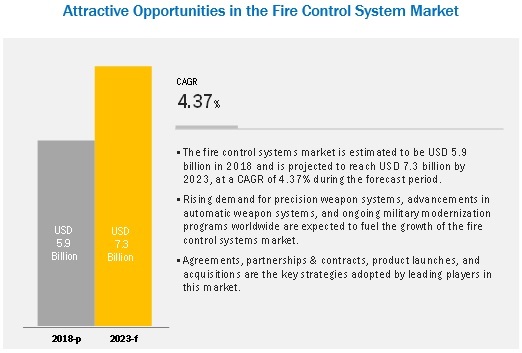 [187 Pages Report] The fire control system market is projected to grow from USD 5.9 billion in 2018 to USD 7.3 billion by 2023, at a CAGR of 4.37% from 2018 to 2023. Some of the factors that are expected to fuel the growth of the fire control system market include the increasing military expenditure by emerging economies to strengthen their respective armed forces. Various defense players, such as General Dynamics Corporation (US), Elbit Systems Ltd (Israel), Rheinmetall AG (Germany), Lockheed Martin (US), Leonardo (Italy) and BAE Systems (UK) are focusing on improving the accuracy of Fire Control Systems (FCS), and also on automating fire control systems in weapon systems. In contrast, various advanced economies have reduced their military budgets as a result of economic slowdown. Based on platform, the airborne segment of the fire control system market is projected to grow at the highest CAGR during the forecast period. Fire control systems play a crucial role in combat aircraft, in hitting targets in air to air missions with accuracy. Across the world, every other fighter aircraft and helicopter is installed with fire control systems. Airborne platforms have evolved to support multi-mission warfare machines capable of conducting a variety of missions. These platforms can be used for command & control, air defense, bombing, air dominance, close air support, reconnaissance, and other roles. Based on weapon class, the fire control system market has been segmented into automatic guns and launchers. The growth of the launchers segment in the fire control system market can be attributed to the high adoption land, airborne, and naval platforms for surface-to-air warfare to engage with main battle tanks and other armored fighting vehicles. Fire control systems are used in various launchers, such as automatic grenades, missile launchers, rocket launchers, mortar launchers, and torpedo launchers. Based on range, the fire control system market has been segmented into short range (0 to 9km), medium range (9 to 80km), and long range (Above 80km). Medium range is more affordable as compared to the long range, and is extensively used in war zones to help aim targets with maximum accuracy. The Asia Pacific region is expected to grow at the highest CAGR in the fire control system market during the forecast period due to increase in military spending by China, India, Japan, and South Korea. The major players in the fire control system market include Elbit Systems Ltd (Israel), General Dynamics Corporation (US), Rheinmetall AG (Germany), BAE Systems (UK), Lockheed Martin (US), Safran (France), Leonardo (Italy), Raytheon Company (US), SAAB (Sweden), Aselsan A.S. (Turkey), Northrop Grumman (US), and Israel Aerospace Industries (Israel), among others. These players have adopted various growth strategies, such as contracts, acquisitions, expansions, and partnerships/collaborations, to further expand their presence in the global fire control system market. In January 2019, Raytheon Company received a contract worth USD 72.5 million from the US Navy for the supply of MK 99 fire control systems for Aegis weapon systems. In December 2018, General Dynamics Mission Systems, a business unit of General Dynamics Corporation, received a contract worth USD 28.0 million from the US Department of Defense for the sustainment of weapons systems installed on nuclear submarines of the US and UK. This contract also included work on fire control systems installed on submarines of both the nations as well as the attack weapon control systems deployed on the submarines of the US. In September 2018, Elbit Systems Ltd. received a contract worth USD 173.0 million from an undisclosed country in the Asia Pacific region to supply naval Remote Weapon Stations (RCWS). Under this contract, Elbit Systems is expected to provide lightweight, fully stabilized dual-axis naval RCWS equipped with a 12.7mm machine guns and ammunition, advanced fire control systems, and a modular electro-optic suite. In July 2018, LONGBOW LLC, a joint venture between Northrop Grumman Corporation and Lockheed Martin, secured a contract worth USD 170.5 million from the US Army for the supply of LONGBOW fire control radars. What are your views on the growth perspective of the fire control system market? What are key dynamics and trends that govern the market, such as drivers and opportunities? What are the key sustainability strategies adopted by leading players operating in the fire control system market? What are the new emerging technologies and use cases disrupting the defense Industry? Which applications do fire control systems play a significant role in? What are the key trends and opportunities in the fire control system market across different regions and their respective countries? How is the competitive landscape changing in the client ecosystem and impacting company revenue shares? 11.6.2.1 Increasing the Procurements of Defense Land Vehicles is Expected to Drive the Fire Control System Market in Latin America. Exhaustive secondary research was undertaken to collect information on the fire control system market, its adjacent markets, and its parent market. The next step was to validate these findings, assumptions, and sizing with industry experts across the value chain through primary research. Both, demand side and supply side analysis was employed to estimate the complete market size. Thereafter, market breakdown and data triangulation were used to estimate the market sizes of segments and subsegments. In the secondary research process, various secondary sources, such as Stockholm International Peace Research Institute (SIPRI), Global Firepower, Hoovers, OEC Atlas Trade, Airbus, Boeing Outlook, company websites, annual reports, SEC filings, Bloomberg, BusinessWeek, and Defense Magazines were referred to identify and collect information for this study. These secondary sources included annual reports, press releases & investor presentations of companies, certified publications, articles by recognized authors. The fire control system market comprises several stakeholders, such as raw material suppliers, processors, end-product manufacturers, integrator and regulatory organizations in the supply chain. The demand side of this market is characterized by various end users, such as government & military organizations. The supply side is characterized by advancements in the fire control system technology, development of fire control systems, and software development. The following is the breakdown of primary respondents interviewed to obtain qualitative and quantitative information about the fire control system market. Key players in the industry and market were identified through extensive secondary research, such as product matrix, developments, geographical presence. After arriving at the overall market size using the market size estimation processes explained above the market was split into several segments and subsegments. In order to complete the overall market engineering process and arrive at the exact statistics of each market segment and subsegment, data triangulation and market breakdown procedures were employed, wherever applicable. The data was triangulated by studying various factors and trends from both, the demand and supply sides, in the fire control system industry. This research report categorizes the fire control system market based on system, weapon class, platform, range, and region.